Nerium carneum Dum.Cours., Bot. Cult., ed. 2. 3: 268. 1811. Nerium flavescens Di Spino ex Roem. & Schult., Syst. iv. 410. Nerium floridum Salisb., Prodr. Stirp. Chap. Allerton 147. 1796, nom. illeg. Nerium grandiflorum Desf., Hort. Bengal. 19. Fl. Ind. 2: 10. 1814. Nerium haqueville Pancher in Cuzent, Iles Soc. Tahiti 235. 1860, nom inval. Nerium indicum Mill., Gard. Dict., ed. 8. n. 2. 1768. Nerium indicum subsp. kotschyi (Boiss.) Rech.f., Fl. Iranica [Rechinger] 103: 3. 1974. Nerium japonicum Hort. ex Gentil, Pl. Cult. Serres Jard. Bot. Brux. 130. 1907. Nerium kotschyi Boiss., Diagn. Pl. Orient. ser. 1, 7: 21. 1846. Nerium latifolium Mill., Gard. Dict., ed. 8. n. 3. 1768. Nerium lauriforme Lam., Fl. Franç. (Lamarck) 2: 299. 1779, nom. illeg. Nerium luteum Nois. ex Steud., Nomencl. Bot. [Steudel] 553. 1821. Nerium mascatense A.DC., Prodr. (de Candolle) 8: 421. 1844. Nerium odoratissimum Wender., Schrift. Ges. Bef. Gesammt. Naturw. Marb. 2. 245. 1831. Nerium odoratum Lam., Encycl. (Lamarck) 3(2): 456. 1792, nom. illeg. Nerium odorum Soland. ex Aiton, Hortus Kew. (W. Aiton) 1: 297. 1789. Nerium odorum var. kotschyi (Boiss.) Boiss. Nerium oleander subsp. kurdicum Rech.f., Fl. Iranica [Rechinger] 103: 2. 1974. Nerium sinense Hunter ex Ridl., J. Straits Branch Roy. Asiat. Soc. 53: 81. 1909. Nerium splendens Paxton, Mag. Bot. 3. 73. 1837. Nerium thyrsiflorum Paxton, Mag. Bot. 3. 73. 1837. Nerium verecundum Salisb., Prodr. Stirp. Chap. Allerton 147. 1796, nom. illeg. 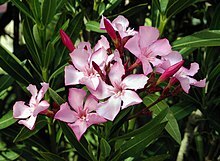 Oleander indica (Mill.) Medik., Act. Acad. Theod. Palat. 6. Phys. 381. 1790. Oleander vulgaris Medik., Act. Acad. Theod. Palat. 6. Phys. 381. 1790. Linnaeus, C. 1753. Species Plantarum, Tomus I: 209. USDA, ARS, Germplasm Resources Information Network. Nerium oleander in the Germplasm Resources Information Network (GRIN), U.S. Department of Agriculture Agricultural Research Service. Accessed on 07-Oct-06. Questa pagina è stata modificata per l'ultima volta il 27 set 2018 alle 18:12.